Meal plans also tend not to be individualized, while meal planning is a flexible process that can support your health goals without making you feel like you either have to stick with it or blow it off. “Tell me what to eat!” As a dietitian, I get that request from friends, family and clients all the time. And when I started out in the field of nutrition, I happily obliged. I created meal plans that spelled out exactly what, when and how much to eat, and the folks who’d asked for them were at least temporarily satisfied. So was I. But over time, I realized that these meal plans were not only unhelpful; they were potentially harmful as well. That’s because meal plans pose the same risks as diets. Both are based on external factors like calories, grams of protein and time of day, rather than internal factors like how hungry you are or what foods sound good. While that structure may seem appealing at first (and necessary to meet health goals), over time, this focus on external cues instead of internal cues can backfire. It can lead to disconnection from your body and a lack of trust around food, which can encourage disordered eating behaviors. Meal plans can also cause you to feel like you “have” to eat at meal times since you won’t be “allowed” to eat until the next dictated eating time, so you may actually overeat. Meal plans also tend not to be individualized, which will leave you unsatisfied. For instance, what if you don’t like some of the foods in the meal plan? Or if you eat a meal but are still hungry? What if you spend all day preparing barbecue chicken, but come dinnertime, you’re really just craving sushi? What if a meal leaves you full but not satisfied? You may be able to tough it out for a bit, but you’ll eventually “slip” and eat (or, more likely, overeat) whatever it is you truly want. Cue guilt and shame around food choices, which can eventually drive overeating and derail your health goals. In other words, like following a rigid diet, eating from the same meal plan over time is not sustainable — and lifelong patterns are what really matter for long-term health and well-being. The solution? Meal planning. Meal planning is a flexible process that can support your health goals without making you feel like you either have to stick with it (“Yay, I did so well!”) or blow it off (“Ugh, I failed.”). It allows you to feel prepared for the week ahead with meals and food, but — in contrast to a meal plan — is based on your preferences and learned experiences. For example, if you make a salad for lunch, but the day is cold and rainy and you just want soup, you can get the soup and save the salad for later. — Take inventory. Think about the week ahead: What nights will you be home for dinner? What days do you want to bring lunch to work? Check your fridge and pantry: What foods do you need to use this week before they go bad? What pantry staples are you running low on? This will help reduce food waste without overeating. — Ask yourself: What foods sound good to me? So often we eat the same things over and over again, whether it’s because we think we “should” or we’ve gotten in the habit of doing so. Start to ask yourself before each meal, “What do I feel like eating?” The more and more you do this, you’ll start to get a better idea of what foods are both filling and satisfying. Then, you can incorporate these into your meal planning and not have to worry about searching for that extra chocolate bar or bag of chips when a meal leaves you wanting. — Pick a few recipes and a few “pantry meals.” Try to pick one to three recipes, along with a handful of meals you can throw together from food in your pantry. Having a few recipes made ahead of time means you won’t be as stressed during a busy week, while having plenty of alternative foods in your pantry means you can swap things out as needed based on what you feel like eating. — Focus on variety rather than calories. Doing so will help you meet nutritional needs without the stress (or ineffectiveness) of calorie-counting. 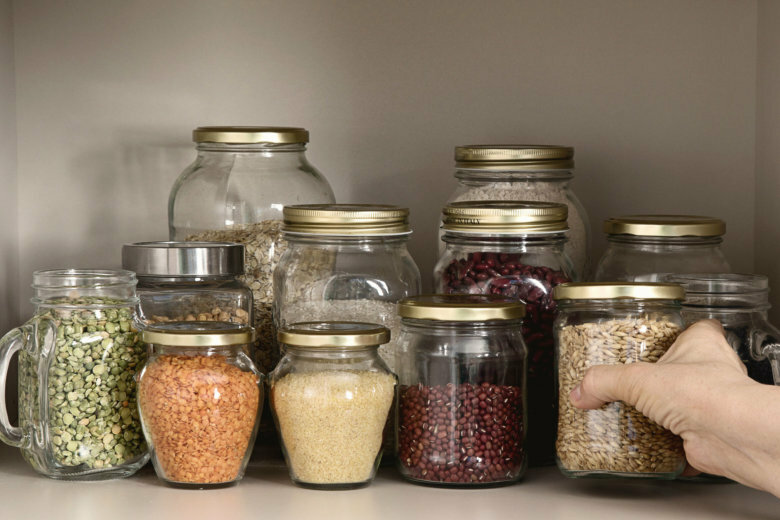 Stock your pantry with a variety of different food options. When at the store, get a few foods from each category: protein (fish, meat, pulses, dairy), vegetables and fruit (try something new each week to add more nutrients into your meals) and grains (pasta, rice, oatmeal, quinoa, farro). When you’re building a meal, think about having a carb, a protein and a fat source. For example, the other night I made a grain bowl using leftover rice, roasted butternut squash and steamed lentils tossed with olive oil and balsamic glaze. — Have spices on hand. This strategy will help you modify a meal in accordance to your current taste preference. Maybe you bought ingredients to make a Mexican beef chili, but wasn’t in the mood for it when you got home. Can you use those same ingredients to make an Asian stir-fry with ginger, soy sauce and sesame oil?